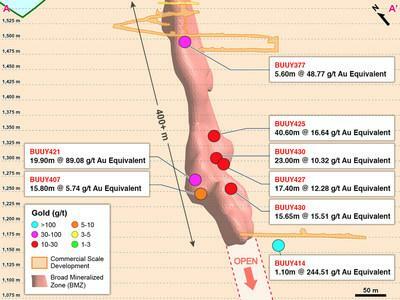 Broad Mineralized Zone 1 ("BMZ1") drilling continues to intercept high-grade gold over broad widths at lower elevations approaching the Higabra Tunnel. TORONTO , Feb.12, 2019 /CNW/ - Continental Gold Inc. (TSX:CNL; OTCQX:CGOOF) ("Continental" or the "Company") is pleased to announce additional high-grade assay results from 12 holes drilled into the Yaraguá system as part of the drilling program at its 100%-owned Buriticá project in Antioquia, Colombia . The Company plans to drill up to 73,500 metres in 2019, consisting of approximately 55,000 metres of capitalized definition drilling and approximately 18,500 metres of exploration-led infill drilling primarily targeting the broad mineralized zones ("BMZ"). "Buriticá continues to impress. On January 30 , we announced an updated mineral resource estimate, which delivered significant across-the-board growth and ranks our Buriticá deposit alongside a very scarce list of deposits globally in terms of size and grade. The Buriticá global mineral resource inventory now sits at slightly greater than 12 million gold equivalent ounces at over 10 grams per tonne (see Table 2). The drill intercepts reported today remind us that the Buriticá system is far from defined and will continue to grow well into the future. We look forward to receiving results from the combined 73,500-metre definition and infill drilling program planned for 2019," said Ari Sussman , CEO. "Most importantly, construction of the Buriticá mine remains on schedule for first gold pour in H1 2020." 19.90 metres @ 88.91 g/t gold and 13 g/t silver, including an ultra high-grade sub-interval of 0.50 metres @ 3,190 g/t gold and 338 g/t silver (BUUY421). The updated mineral resource estimate for the Buriticá Project was prepared by Continental under the guidance and supervision of Mr. Ivor W.O. Jones, M.Sc., FAusIMM, CPgeo, P.Geo, who is an independent Qualified person (QP) under NI 43-101 guidelines. See Company release of January 30, 2019 for detailed information on the updated mineral resource estimate. Mineral resources which are not mineral reserves do not have demonstrated economic viability. The estimate of mineral resources may be materially affected by environmental, permitting, legal, marketing, or other relevant issues. The mineral resources were estimated using the Canadian Institute of Mining, Metallurgy and Petroleum (CIM), CIM Standards on Mineral Resources and Reserves, Definitions and Guidelines prepared by the CIM Standing Committee on Reserve Definitions and adopted by CIM Council. The quantity and grade of reported Inferred mineral resources in this estimation are uncertain in nature and there has been insufficient exploration to define these inferred mineral resources as an indicated or measured mineral resource and it is uncertain if further exploration will result in upgrading the inferred mineral resource to an indicated or measured mineral resource category. Contained metal and tonnes figures in totals may differ due to rounding. Gold equivalent grades and ounces was calculated at silver/gold ratio of 60:1. This formula is consistent with the May 11, 2015 Mineral Resource Estimate and is produced for comparative purposes only. Mineral Resources have been prepared to a minimum 1 metre mining width. Continental's 100%-owned, 75,583-hectare project, Buriticá, contains several known areas of high-grade gold and silver mineralization, of base metal carbonate-style variably overprinted by texturally and chemically distinctive high-grade mineralization. The two most extensively explored of these areas (the Yaraguá and Veta Sur systems) are central to this land package. The Yaraguá system has been drilled along 1,350 metres of strike and 1,800 vertical metres and partially sampled in underground developments. The Veta Sur system has been drilled along 1,300+ metres of strike and 1,800 vertical metres and has been partially sampled in underground developments. Both systems are characterized by multiple, steeply-dipping veins and broader, more disseminated mineralization and both remain open at depth and along strike, at high grades. The BMZ consists of a group of modelled precious metal-bearing veins in the current mineral resource estimate block model with mineralization occurring between these veins, generally in the form of veinlets at oblique angles to strike. The majority of the mineralization between modelled veins is not in the current mineral resource estimate, providing potential upside both in terms of identifying significantly broader and more productive zones for mining and increased mineral resources. To date, the Company has identified up to seven BMZ targets for testing and will systematically drill each target zone as underground mine development advances. BMZ1 encompasses a matrix of the east-west trending FW, San Antonio and HW veins as well as a package of a NW‑SE vein and subsidiary veinlets. For stope definition core drilling, the Company applied its standard protocols for sampling and assay. The HQ3 samples were full core and provided sample widths between 0.2 to 1.0 metres weighing approximately 2 to 8 kilograms. Custody of the Samples were transferred at the mine site to Actlabs Colombia using rigorous chain-of-custody procedures. Full-core HQ3 samples are prepped and analyzed at Actlabs Colombia's ISO 9001 accredited assay in Medellín, Colombia . The remainder of crushed rejects and pulps are stored in a secured storage facility for future assay verification. Blanks, pulps duplicates, coarse duplicates and purchased certified reference standards are inserted into the sample stream to monitor laboratory performance. A portion of the samples are periodically check-assayed at ALS Peru's ISO 9001 accredited assay laboratory in Lima, Peru . This press release contains or refers to forward-looking information under Canadian securities legislation—including statements regarding: estimation of mineral resources; advancing the Buriticá project and construction completion; drilling results and advancement in respect of the BMZ mineralization; mine production planning; exploration results and potential mineralization; commercial production and exploration and mine development plans—and is based on current expectations that involve a number of significant business risks and uncertainties. Forward-looking statements are subject to other factors that could cause actual results to differ materially from expected results. Readers should not place undue reliance on forward-looking statements. Factors that could cause actual results to differ materially from any forward-looking statement include, but are not limited to, an inability to advance the Buriticá project to the next level, failure to convert estimated mineral resources to reserves, capital and operating costs varying significantly from estimates, the preliminary nature of metallurgical test results, delays in obtaining or failures to obtain required governmental, environmental or other project approvals, political risks, uncertainties relating to the availability and costs of financing needed in the future, changes in equity markets, inflation, changes in exchange rates, fluctuations in commodity prices, delays in the development of projects and the other risks involved in the mineral exploration and development industry. Specific reference is made to the most recent Annual Information Form on file with Canadian provincial securities regulatory authorities for a discussion of some of the factors underlying forward-looking statements. All the forward-looking statements made in this press release are qualified by these cautionary statements and are made as of the date hereof. The Company assumes no responsibility to update them or revise them to reflect new events or circumstances other than as required by law.